Dress A Day reader jrochest let me know that if you must own a Bjork swan dress (not the one from the Oscars but a "highly superior pearl-encrusted" version from her Vespertine tour) you can do so by going here. There are a lot of other interesting (by which I mean "largely unwearable") clothes up for auction as well, most of them at very reasonable starting bids (although all the auctions still have five-plus days to run). The auction benefits Oxfam and, jrochest points out, "You can also buy and donate goats, camels and trees. A goat costs much less than Bjork's dress, and would certainly be more flattering on." The swan dress was *funny*. It was supposed to be funny. She laid a damned egg on the red carpet. She knew exactly what she was doing, and IMHO achieved the desired effect.Unlike, say, Demi Moore’s bicycle pants. I’m a fan of the swan dress, too. At the very least, it wasn’t boring, which is the best effect most stars on the red carpet achieve now that the stylists and advertisers have taken over dressing them. Damn, the dresses worn at the Emmys were bor-ing! I know that the Bjork dress was supposed to be a joke, but … I dunno, I just didn’t enjoy it the way I think she wanted it to be enjoyed. I think it was the sartorial equivalent of doing knock-knock jokes in your acceptance speech. Sure, it’s funny, but is funny what’s supposed to be happening?I much preferred the woman a couple years earlier who wore the dress made out of Amex cards. That was funny and pointed and actually worked as a dress, to boot! I adore the way Bjork usually dresses in her everyday life, though. 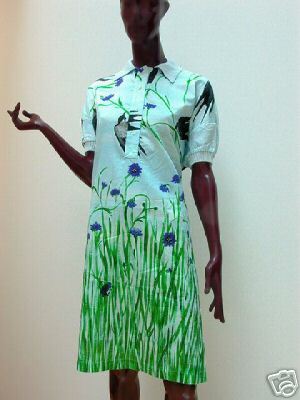 Yep, the Bjork dress was designed to be funny, I’m *almost* sure, although you can never tell with Icelanders. Like Bjork, they are astoundingly beautiful, but odd with it.Thanks for linking to this, Erin, and I’m glad you put this dress up. It’s pretty, which is unusual for a Belgian deconstructionist.And whatever I’ll buy, I’ll get a goat. You can’t go wrong with a goat.